Police officer lays assault charges on EFF MP - SABC News - Breaking news, special reports, world, business, sport coverage of all South African current events. Africa's news leader. EFF MP Marshall Dlamini has been charged with assault. A police officer has opened an assault case against a member of the Economic Freedom Fighters (EFF) after an incident in parliament. 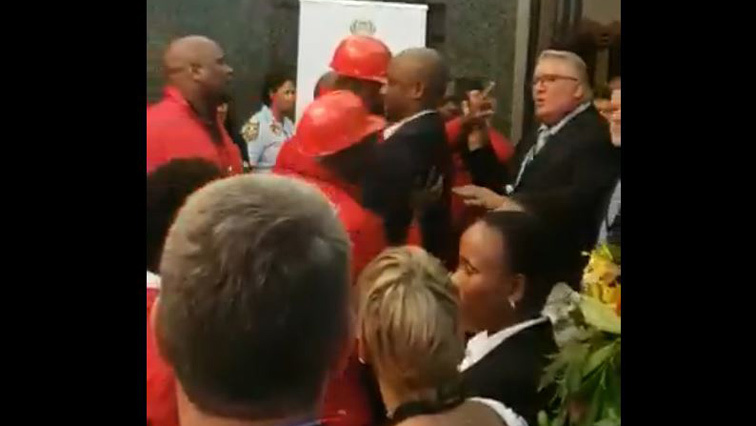 The EFF’s Marshall Dlamini assaulted warrant officer Johan Carstens, following President Cyril Rampahosa’s State of the Nation Address on Thursday. The EFF has defended the incident saying it happened after it uncovered a plot by elite members of the police and right-wing groups to assassinate its leader, Julius Malema. Dlamini apparently thought Carstens was part of the plot. A video of Dlamini hitting Carstens has gone viral on social media. The EFF has sought to defend the incident. The party’s Veronica Mente says the police officer had targeted Malema. “This security was pulling the CIC and he just charged for him. He could have charged for the DP because he was behind CIC but he charged for the CIC he pulled him by the clothes pulled him with his hands, everything. Even the security is struggling to separate the guy from the CIC until Marshal came from the other side,” explained Mente. This entry was posted on 09 Feb 2019,01:22PM at 1:22 PM and is filed under SONA, Politics, Homepage Featured Story Slider. You can follow any responses to this entry through the RSS 2.0 feed. Both comments and pings are currently closed.